Cook the urad dal with the bay leaf, turmeric and 1 tsp grated ginger until the dal is really tender. This is best done in a pressure cooker. 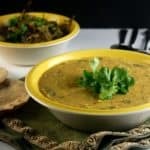 If you don't have one, soak the dal for at least two hours, then place in a large saucepan with the other ingredients and water to cover by an inch. Bring to a boil, cover, lower heat to a simmer, and cook until the lentils are really soft and mash easily. Heat the oil. Add the cumin seeds and, when they sputter, add the minced onions. Add a pinch of salt and saute the onions until they are just beginning to turn color. Add the tomatoes and saute for a couple of minutes. Then add the coriander powder, cayenne or paprika, and garam masala powder. Stir well to mix, then add the cooked dal and mix really well. You can discard the bay leaf at this time. Bring to a boil and lower the heat to a simmer. If the dal is really thick, add water. Let the dal cook for five minutes for flavors to merge. Add the almond paste and chopped coriander. Squeeze in the lemon juice. Add salt to taste. Stir well and turn off heat. Serve hot with rice, a subzi, and phulkas.